Back near the end of the second 365 Days project, we were all treated to an album recorded by Tony Randall, titled "Vo Vo De Oh Doe". 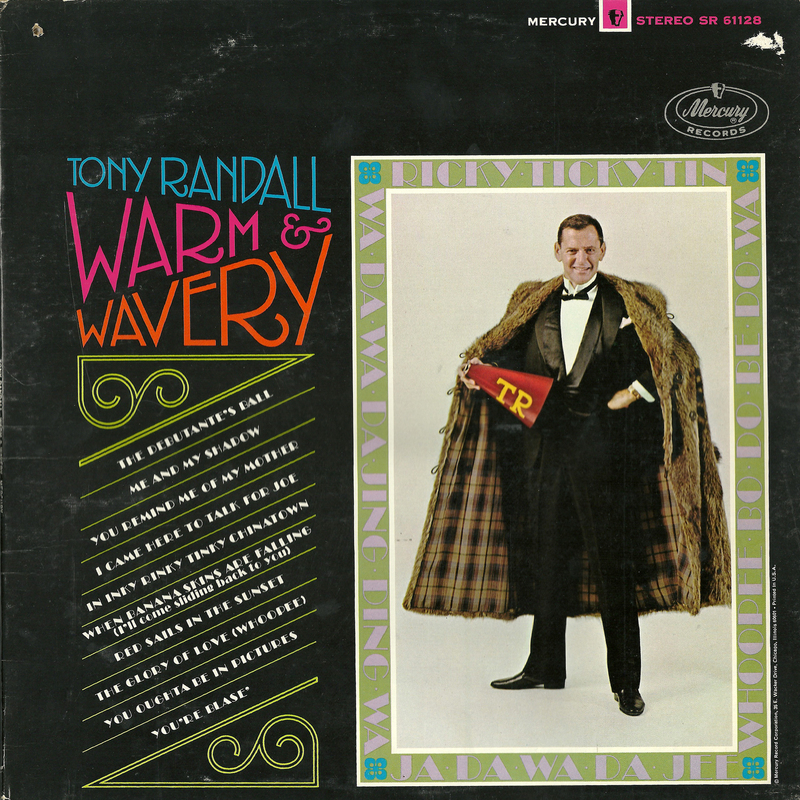 Recently, while at a huge fundraising music sale, I was directed (by a like-minded friend) to a booth where they were selling a copy of another Tony Randall album, "Warm & Wavery", containing more of the same type of music. Amazingly, the entire album runs just over 22 minutes. On the other hand, it was being offered for sale for one big dollar! Just four quarters! Quite the bargain - the last note on "I Came Here to Talk for Joe" alone is worth more than that! You sure can drop 'em, Bob. Here's one we'll all be rushing to 'enjoy', lol. And for one terrifying moment - I thought the tracklist contained "China My China" and the resulting near-circuit overload was narrowly missed; Whew! When I was fifteen, I sat next to Randall during a dinner and lied to him that I had already read Crime and Punishment. "Oh really!" he said, humoring me. He then gave me a reading list that included Dos Passos. 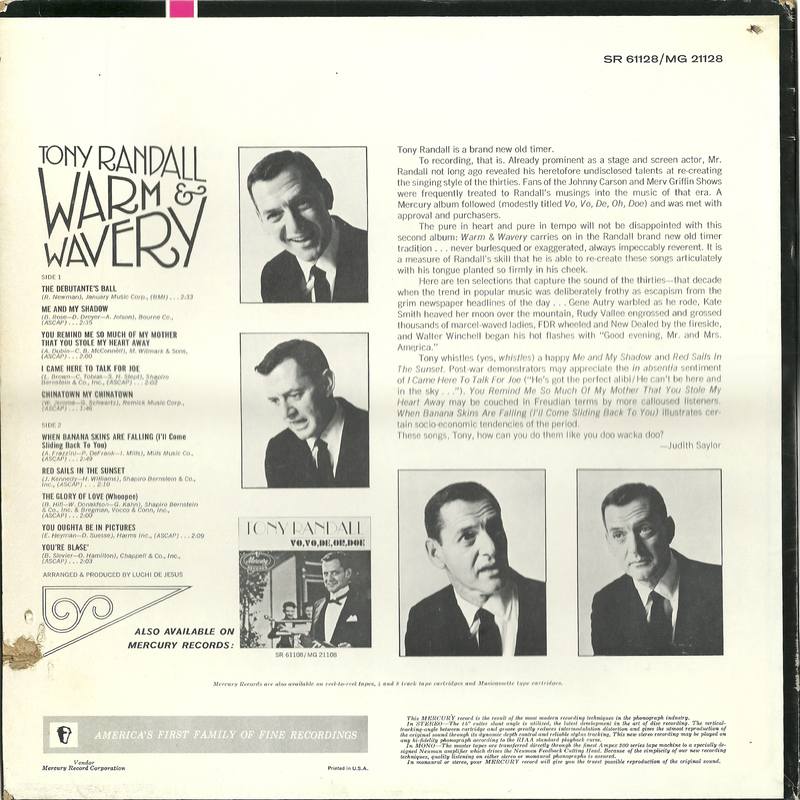 My sister met one of her best childhood friends when she told another girl " I have a Tony Randall Record" and her soon to be friend said oh I have that to. My mother bought this for my sister at Grants and her friend Erica's father Richard Freed was a music critic who went to school with Mr. Randal. When I was 9 years old I knew ever song on this record andI remember them all! That last note on "I Came Here to Talk For Joe" doesn't even exist on the scale. This is great! Thank you.